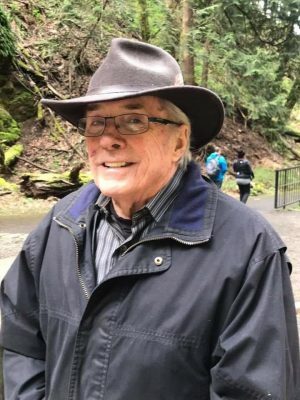 FULTON, NY – Robert “Bob” Griswold, of Troutdale, Oregon, died Tuesday February 26, 2019, at Adventist Medical Center in Portland, Ore., with his wife and family by his side. A native of Fulton, NY, he was the son of Charles and Vivian (Reidy) Griswold. Bob was a graduate of Fulton High School Class of 1958. He entered the United States Air Force and served eight years active duty, he then served in the Air Force Reserves retiring as a Master Sergeant from Portland AFB in 2001. His working career was in sales, from life insurance to real estate. Bob loved hunting, going to the beach (Oregon Coast), the Columbia River Gorge, trips to Reno, and working in his yard. Bob especially loved spending time with his family and adored his grandchildren. He was always ready to tell a story or joke to make you laugh. He was very proud of his military career. Bob married the love of his life, Lyn Smith, in July 2000. Bob is survived by wife, Lyn; his children, Gina (Tony) Profitt of Sandy, Ore., Chelle (Jay) Oakley of West Lin, Ore., Kyle (Christi) Smith of Jacksonville, Fla., Ryan (Tiffany) Smith of Redmond, Ore., and Cassie (Ryan Samel) Smith of Troutdale, Ore.; his sisters, Louella LeClair of Fulton, NY, Darlene (Charles) Kerfien of Fulton, NY and Shirley (Len) Greco of Gainesville, Ga.; his brothers, Curtis (Sheree) Griswold of Fulton, NY, and Jerry (Dianne) Hardy of Sebastian, Fla.; and by his grandchildren, Levi, Vera, Christi, Niki, Connor, Simon, Mallory, Allie, Austin, Jakob and Zoey. He was predeceased by his parents; and by a niece, Colleen LeClair Nickolas. MSGT Griswold was interred at Willamette National Cemetery, Portland, Ore., with full military honors on March 15, 2019, his 78th birthday. A family memorial service was held on March 17, 2019 at Fogarty Creek State Park (Pacific Ocean) his favorite place where he and his wife spent many happy days. Sorry to hear of his passing our thoughts and prayers go out to the families. Very sorry to hear of your loss. Thinking of you all. My condolences. Sorry to hear of your brothers passing. Thoughts and prayers are with all of the Griswold family.